As more and more weddings veer away from tradition, modern engagement practices are also seeing new trends. If you're not looking to spend over P25,000, you can get an 18 carat diamond with a 14K white gold band at P19,800 or a .21 carat diamond with the same band at P24,600. Meanwhile, a .73 carat diamond could go upwards of P125,000. The same feature also notes that an engagement ring with an illusion setting (tiny diamonds fitted together for maximum effect) can also be a great option if you're looking for a more dramatic look without having to spend too much. You can find one for about P40,000 to P90,000. Aside from birth stones, another way to lower your cost is to opt for semi-precious stones. One Pinay even shared that while planning an eco-friendly wedding on a budget, they were able to source a wedding ring made with Narra wood. They wanted "something biodegradable and easily broken down. Just think about it-if it were to ever get lost, you wouldn't be polluting the earth!" One groom-to-be argues that "I think that this is now an outdated rule. Three months' worth of salary for an engagement ring may not be good enough," and spent over half a million pesos on his purchase, while another says that "This belief would probably be a bit funny to me. I think it would actually depend how much your salary is. My fiancée and I are both practical. I didn't spend too much on the engagement ring, with the idea that I really wanted to get us a nice house." He ended up spending about P60,000 to P70,000 on a ring. What finger, hand does an engagement ring go on? Some men also opt for watches or different accessories, so it's best to discuss this with your groom before you decide to splurge—unless you want it to be a surprise, in which case, just be sure to consider your groom's personality and style before spending on a gift. 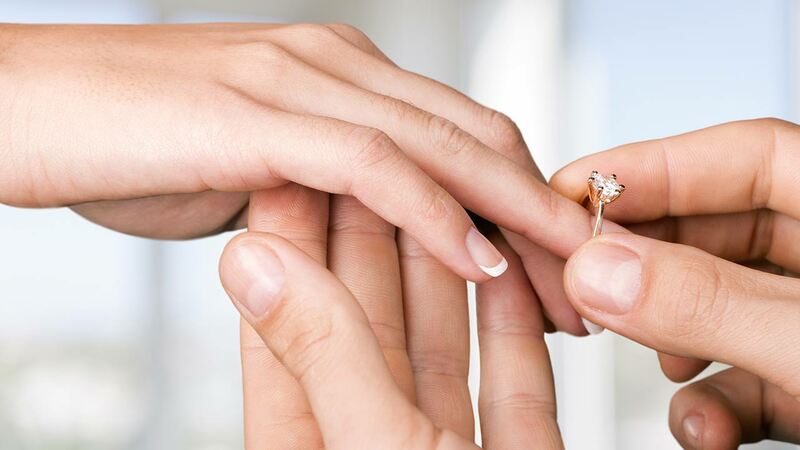 If you own a traditional diamond ring, you'll want to take care of it regularly. You can take your ring to your suki jewelry store every few weeks to have it professionally cleaned with steam, but you can also use warm water, a mild dishwashing soap, and soft a toothbrush to keep it bright. It helps to soak the ring for 10-30 minutes, too so you won't have to brush too hard.